Oops, I forgot to mention the Dobell Drawing Prize! 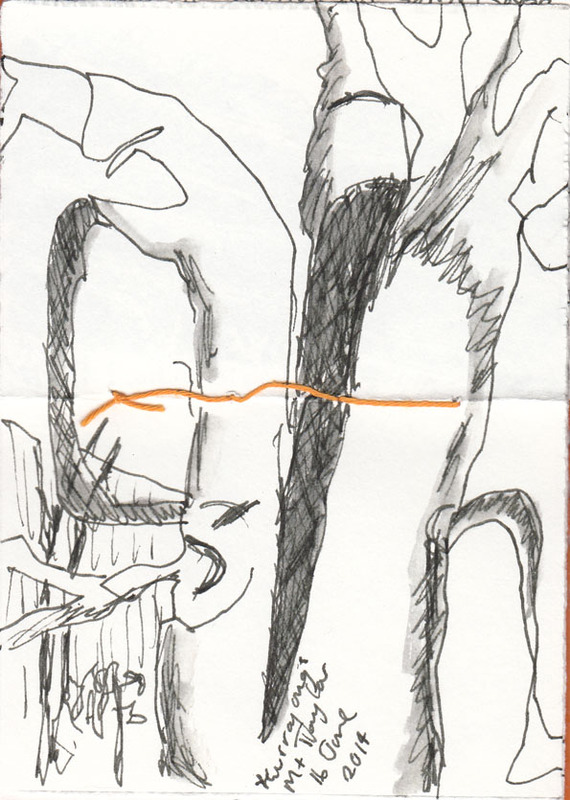 Sketching gums trees on a sunny holiday afternoon. When I looked back over this week’s sketches I realised that I had made only one. A poor sad solo drawing of the new heaters that our local coffee shop are using. 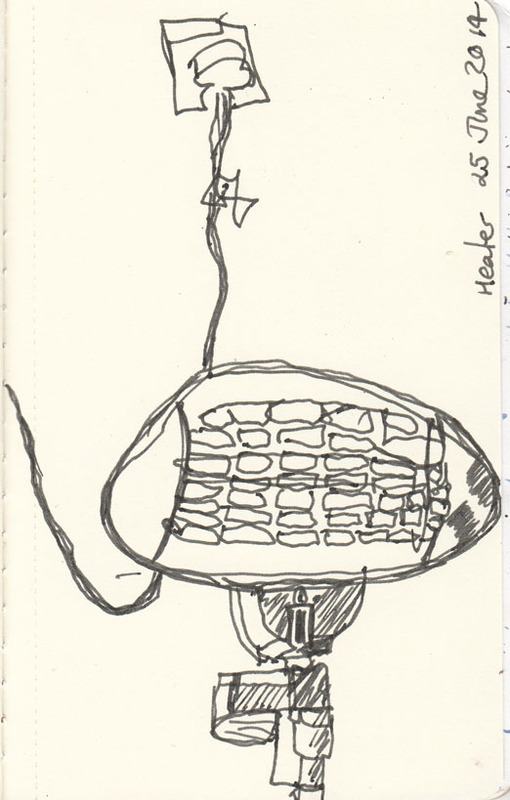 Heater at the coffee shop, pen and ink, 25 June 2014. This prompted me to make another drawing to keep it company. Here is my column heater, getting quite a work out during our first really icy blast of winter for this year. This is quite a mix of media, acrylic paint marker, conte crayon and marker pen. 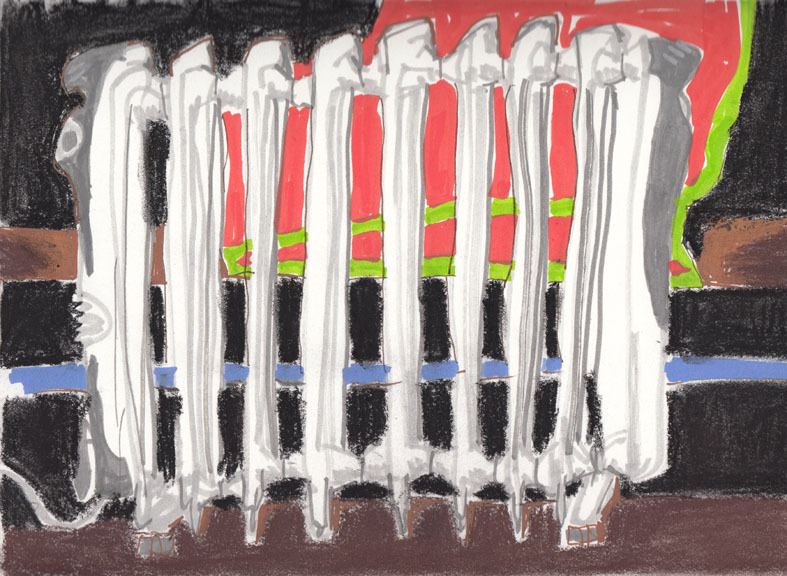 Heater, acrylic paint marker, marker pen and conte crayon, 28 June 2014. A favourite walk of ours is to the small stand of kurrajong trees (Brachychiton populneus) that grow on the shoulder of Mt Taylor. These trees are often referred to as ‘bottle’ trees, for their swollen trunks, although it is not a strong feature of this particular species of kurrajong. 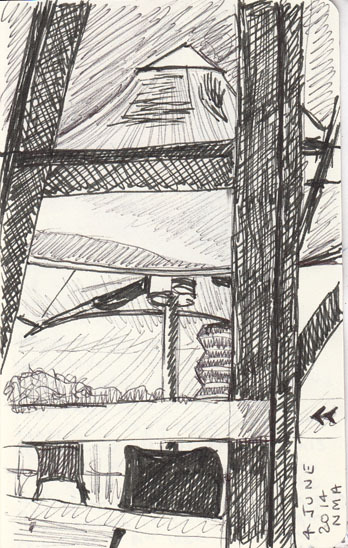 I took only my smallest sketchbook, made by a friend of mine, and my ink pen on this walk. 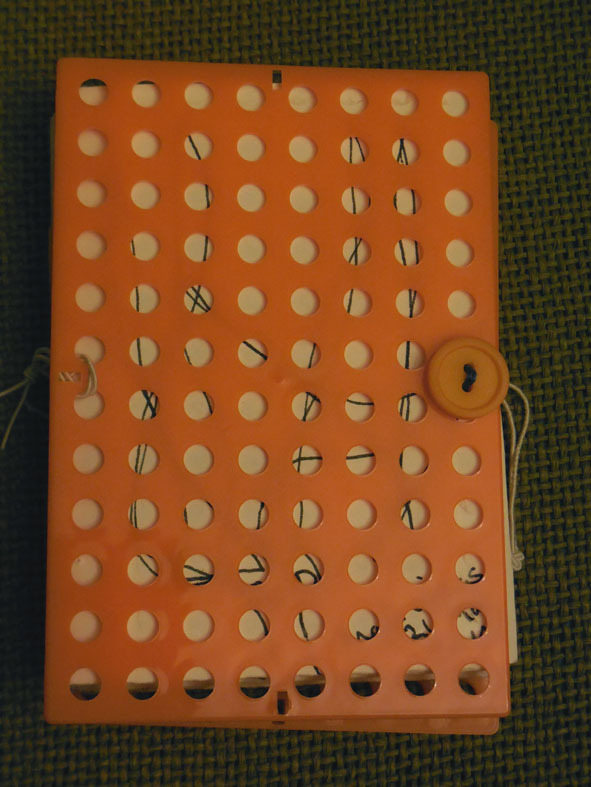 The book is approximately 70 x 100 mms, (or 3×4 inches). I did three sketches. The first of the triple trunk of the main kurrajong tree, which has seeded it’s offspring in the bush around it. 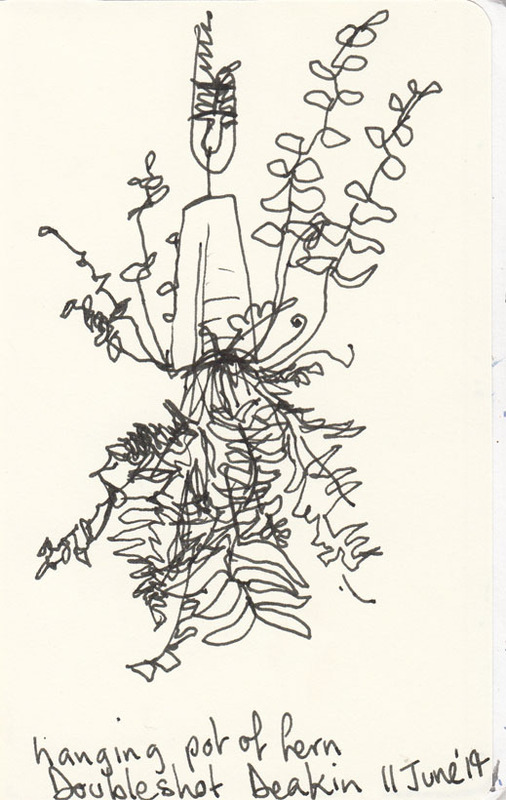 The triple-trunked kurrajong, pen and ink, 16 June 2014. Next my interest was captured by what I could see behind the tree. This is a series of high voltage power cables that traverse this side of the mountain – they actually hang in much smoother curves than I could draw! It was a challenge to try and capture the light-grey cables against the darker toned eucalypt trees on the higher slope of the mountain. 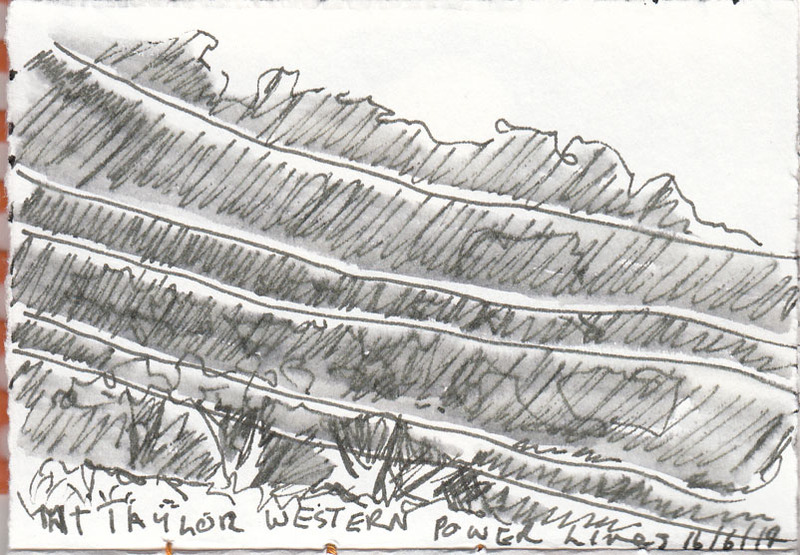 Power cables against the hillside, pen and ink, 16 June 2014. Last of all was a small cluster of dead leaves which were highlighted by the late afternoon sun. Dead leaves, late afternoon, pen and ink 16 June 2013. Here are some drawings I’ve done over the past few days. First a blind drawing of the Academy of Science building, also known as the Shine Dome and familiarly called ‘the Martian Embassy’ by locals. Behind it stands one of the newest developments in central Canberra, the Nishi Building in the New Acton precinct. 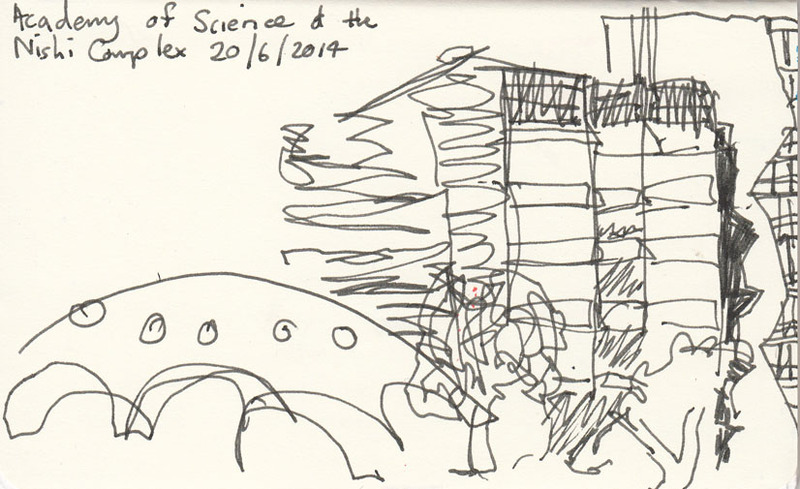 The Academy of Science Building, also called the Shine Dome (a.k.a ‘the Martian Embassy’) and the Nishi Building, New Acton, pen and ink, 20 June 2014. 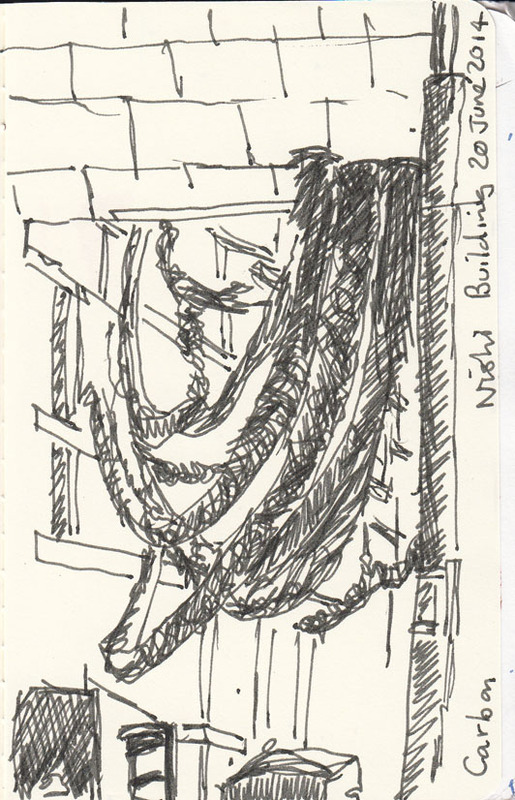 Outside the Nishi Building, (which I’ve written about here) is the sculpture ‘Carbon’, it appears to be extruded from the buildings’ understorey and extends along the facade. pen and ink, 20 June 2014. The city of Canberra was designed, originally by Walter Burley Griffin, who was inspired, in part, by the Garden City movement. In practical terms for Canberra residents today it means that the city incorporates large areas of bushland. Along with the natural landscape come lots of native animals and animals and cars don’t interact on an equal basis. Every day kangaroos die as a result of being hit by cars. Yesterday I came across one such victim not far from my own house. It was a female Eastern Grey kangaroo, our most common kangaroo species and while the species is not in any way endangered it is still a sad experience to find one of these beautiful creatures dead on the roadside. 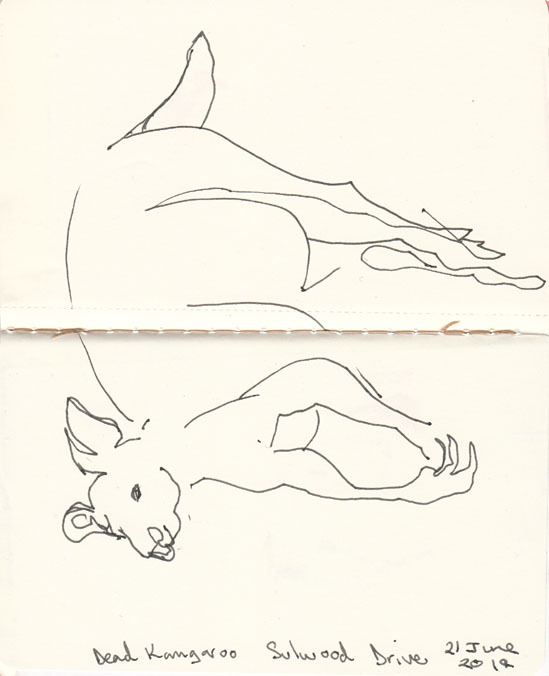 A dead Eastern Grey Kangaroo, pen and ink, 21 June 2014. I drew in two ‘new’ places this week. Appointments and exhibitions took me to different spots around the city. First a cafe in a suburb I rarely visit offered a very trendy setting with a wall of stacked wood and these intriguing pots hanging upside down from the ceiling. Clearly this fern was loving it. 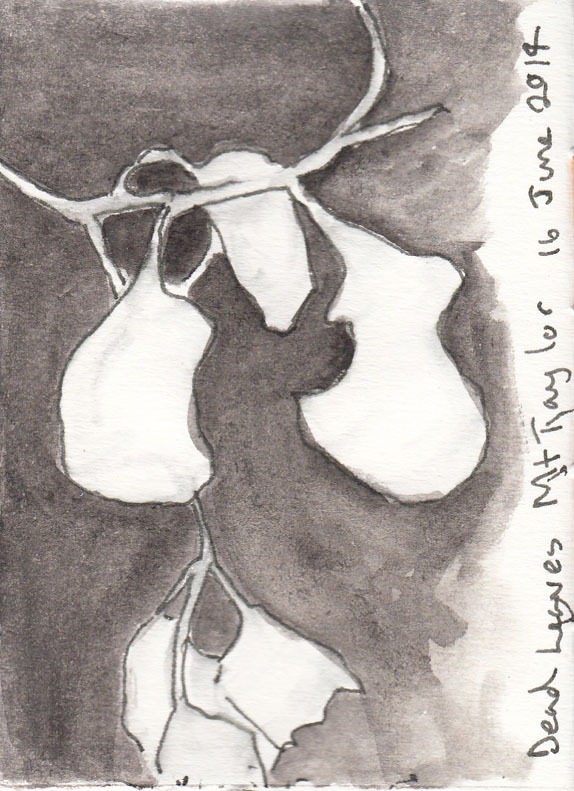 An upside down hanging pot, pen and ink, 11 June 2014. Less thrilling was the overwhelming smell of gas when, as it turns out the next door petrol station was having it’s tanks refilled. Both my partner and I and several other groups of people thought a gas explosion was imminent. Thankfully the staff told us what the odour was – just before we all headed out the door to save ourselves! While it is definitely a place I’ve visited many times, I’ve never stopped to draw inside the the National Library of Australia before. The Bookplate Cafe, tucked into a corner of the foyer has the luxury of incorporating several stained glass windows designed by the artist Leonard French. Aided by what must have been the biggest bucket of coffee I’ve ever had, I was able to make the following sketch. That is until my pen ran out of ink. All to the good, according to my partner who told me that I was in grave danger of over-working the sketch as it was. 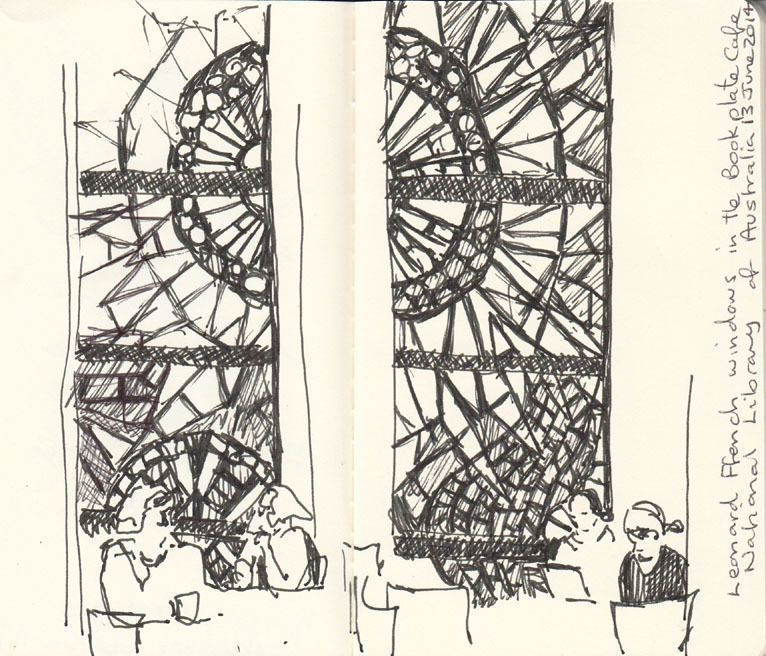 The bookplate cafe and windows by Leonard French, pen and ink, 13 June 2014. Last week we rode our bikes around Lake Tuggeranong from where I made this sketch of the Bullen Ranges, topped by fast moving clouds. 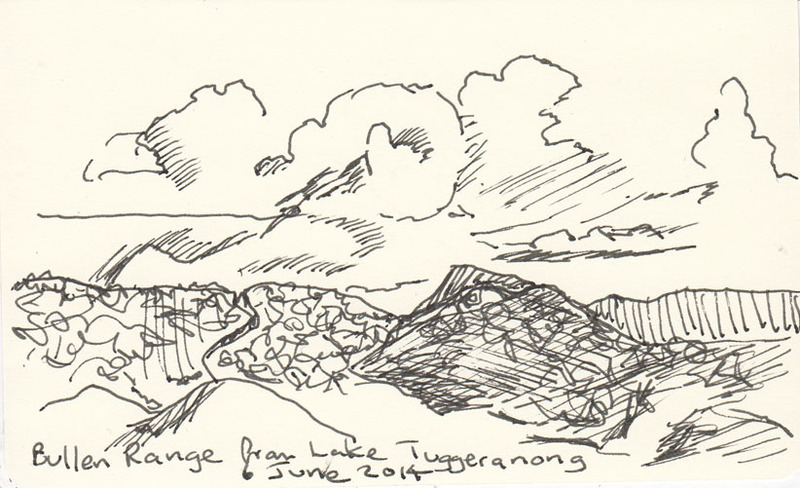 The Bullen Range from Lake Tuggeranong, pen and ink, 6 June 2014. While we were eating our picnic lunch we had a number of avian visitors, not just the regular Silver Gull (Larus novaehollandiae) a common inland bird. 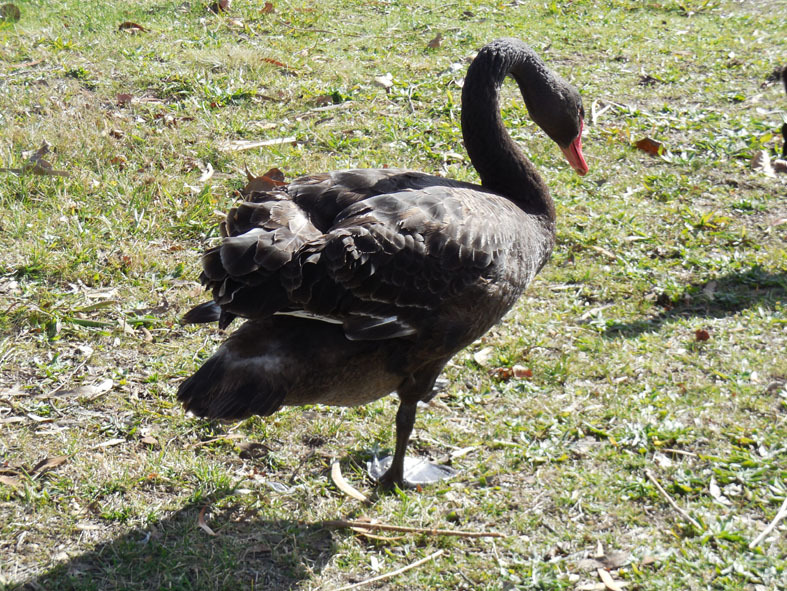 I’d put my drawing tools away to eat lunch and so I was caught off guard when a black swan decided to pay us a visit. All I did was take photos, rather than draw! Here are some of those photos. 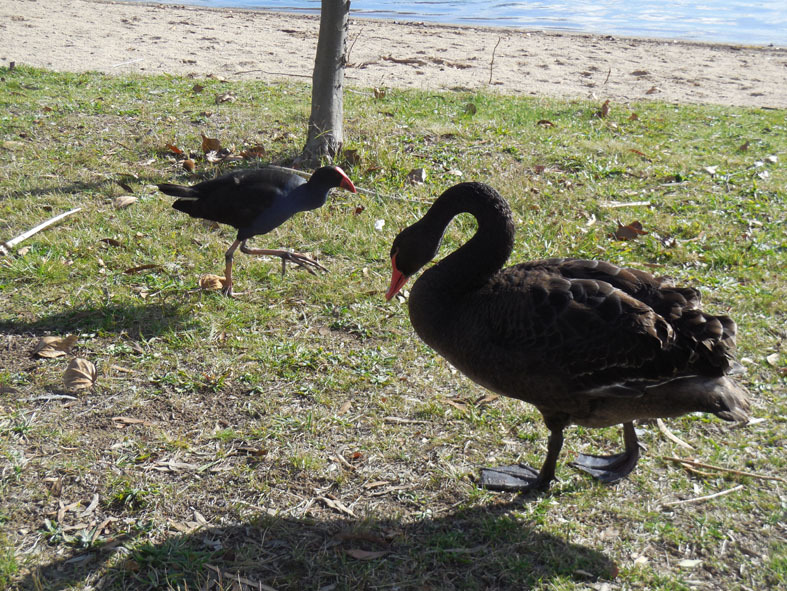 Purple Swamphen (Porphyrio porphyrio) and Black Swan (Cygnus atratus). I’ve seen, probably the same swan, at that part of the lake on previous bike rides so next time I’ll have my pen at the ready! 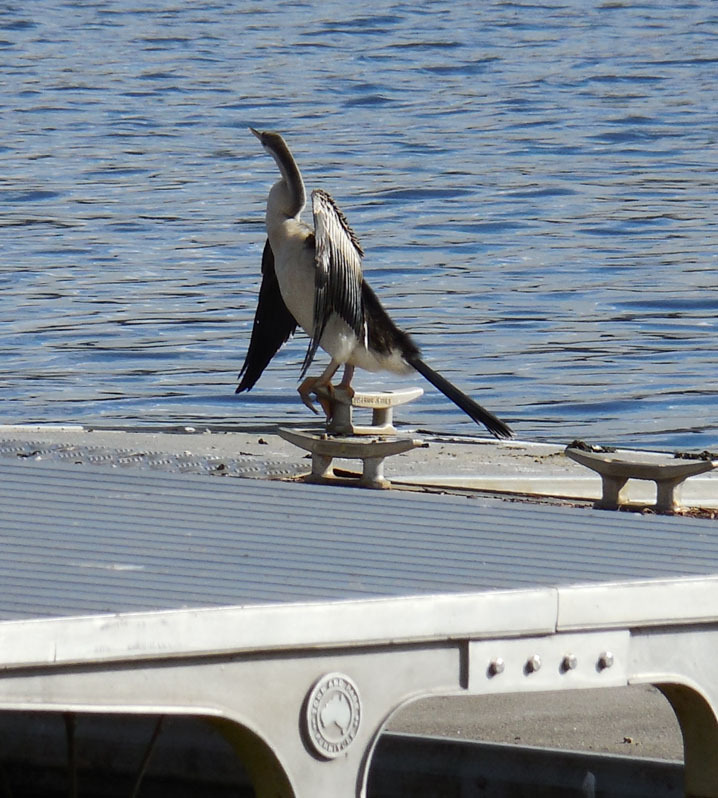 Further along the bike path we spotted several Australian Darter’s (Anhinga melanogaster) drying their wings on the Sea Scout’s jetty (given we are over a hundred kilometers from the coast I always enjoy the irony of this name). I did have my pen out, but they were not happy with us approaching and flew off before I could sketch them. An Australian Darter (Anhinga melanogaster) in a fairly common pose. Given it was a dull and foggy day with no prospect of seeing the sun before midday, we decided to go to head for the warm interior of the National Museum of Australia (NMA) to see their current major exhibition, Old Masters, Australia’s Great Bark Artists. Holding the largest collection of bark paintings in the country (and I’m assuming probably the world) the Museum has access to some truly great masterworks. If possible, I’d urge you to see the works in person, however if that’s not possible you can explore a large number of these works online, through the link above. Caution: The NMA website includes images and names of deceased people that may cause distress to Aboriginal and Torres Strait Islander peoples. Painting on bark seems to have become the forgotten form of Aboriginal art, at least to the Australian public in general. The works in this exhibition are all by male artists from Arnhem Land in the Northern Territory. Some were collected in the mid 20th century and some of the artists represented, like John Muwurndjul, are still actively painting today. The works are all painted in ochres, clay and charcoal on sheets of bark from a stringybark tree, Eucalyptus tetrodonta. One of the features of paintings from this region is the rrark, the fine cross-hatching that is an integral part of many works. The quality of the fine, fine rrark just stunned me. Some lines are just 1 mm thick and are consistently painted across the large barks in steady lines. I only learned at the show that the brushes used to make the fine lines are made from human hair. Narritjin’s Brush, 1970’s, a gift to the National Gallery of Australia, from Professor Howard Morphy in 1986. 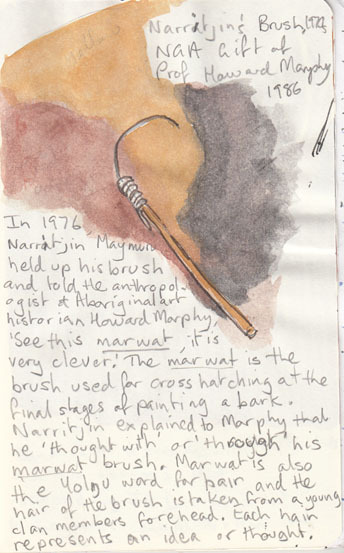 ‘See this marwat, it is very clever.’… Narritjin explained to Morphy that he ‘thought with’ or ‘through’ his marwat brush. When I came home I couldn’t resist having a go at cross-hatching for myself. While I started with watercolour I quickly ran into trouble with getting sufficient opacity in my whites. So I just used my acrylic paint markers instead. I also tried some different colours, such as blue and clear red to see how they might work. 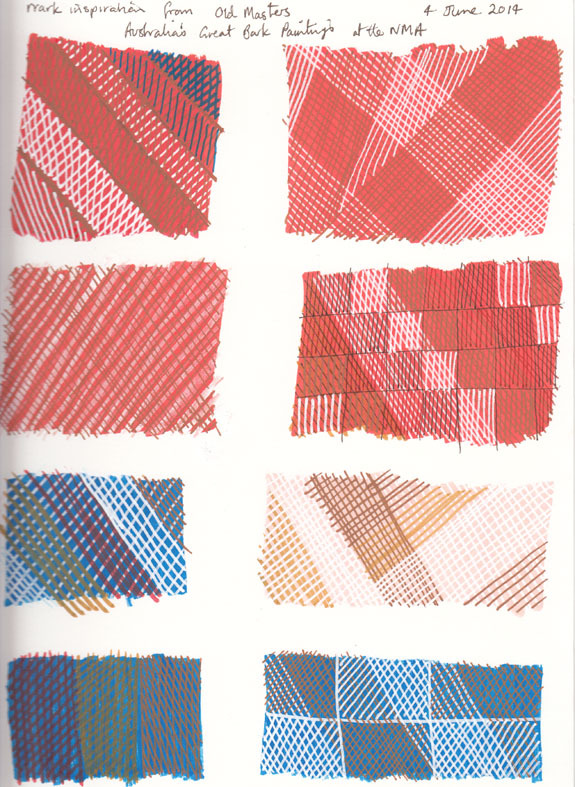 I hasten to add that while I am interested in exploring how this technique ‘works’ I am not attempting to appropriate specific patterns that are the cultural property of the artists in the show. A page of cross-hatching inspired by the work in the Old Masters exhibition at the National Museum of Australia. There is so much that any artist could learn from in this show. The array of compositional devices that the artist’s use would be a lesson for most of us. The striking portrayal of a kangaroo being stalked by a hunter through the bush, Hunter and Kangaroo, 1974, by Bob Balirrblairr Dirdi, I found particularly impressive – the painting is the first image in this set. My partner also commented that these works demonstrate just how high the levels of invention can be taken when starting from such a limited range of materials. This is another one of the amazing shows that the NMA has mounted that seem to be completely under-rated by the viewing public. I understand from the staff at the museum that visitor numbers are lower than hoped for. Much as I love the bold and bright acrylics and wildly expressive brushwork of contemporary Aboriginal art, this exhibition amply demonstrated to me the ability of these artists and the true quality of their art. Three cafes in three days, a bit more than my usual quota of coffee for the week. 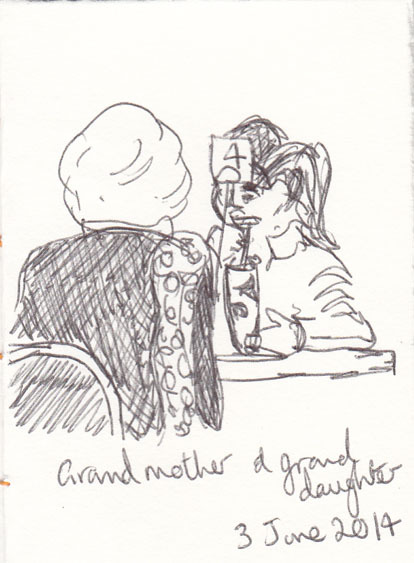 I started off with drawing a grandmother and granddaughter, having a break together. The girl developed a somewhat ‘cubist’ head as she kept moving quite quickly. A few of my strokes ended up in unintended places (well that’s my excuse). Grandmother and granddaughter at the coffee shop, 3 June 2014. The next day found us having lunch at the National Museum of Australia, after having seen the Old Masters: Australia’s Great Bark Artists (more of that in a future post). Umbrella and a view back towards the city from the National Museum of Australia, 4 June 2014. Lastly back to our regular place for a coffee today. The sun encouraged us to go for a walk before more clouds blew in. I particularly liked the way the fluting on the glass reminded me of colonnades and arches. 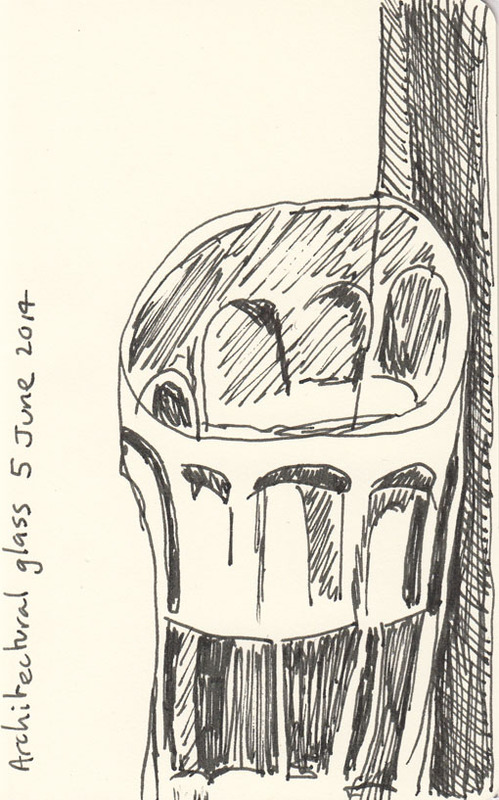 A glass architecture, pen and ink, 5 June 2014.